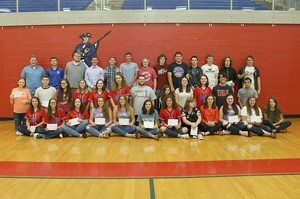 A dedication to rigorous class has paid off for former and current students at Allen County-Scottsville High School. Opening day activities last week at the high school included the announcement that 55 students enrolled in Advance Placement (AP) courses last year earned qualifying test scores---thus earning college credit and a $75 cash reward per course. In partnership with the AdvanceKentucky initiative, teachers received training and supplies so that AP class opportunities are available to AC-SH students. The program is designed to dramatically expand access to and participation in rigorous college-level work in high school, particularly among student populations traditionally underrepresented in these courses. Toward the end of classes last spring, AP students took the College Board’s AP Exam in their subject area. Scores are reflected on a five-point scale. A score of five is “extremely well qualified.” A four score in “well qualified” with a three score being considered “qualified.” Students scoring a three or higher on the AP exam are qualified to receive college credit for their work or advanced placement in college classes. Earning qualifying scores in AP Biology were 12 students. The list includes Colton Barton, Katelyn Bewley, Rachel Bomar, Alexa Coleman, Harris Gregory, Tyler Hunt, Jackson Montgomery, Rebekah Quinonez, Lauren Riffe, Cayden Ross, Jason Sikes, and Mason Towery. In AP Computer Science, eight students attained qualifying scorers. The group included Maggie Adams, Chance Baldwin, Robin Gagen, Alexus Higginbotham, Aaron Logsdon, Jackson Montgomery, Jacob Spearman, and Lillie Swygart. Eight students received qualifying scores in AP Psychology. The list includes Maggie Adams, Aaron Borth, Marcus Carter, Grace Costello, Amicia Damico, Harris Gregory, Silas Newton, and Kris-Anne Pardue. Earning qualifying scores in AP English Literature were 13 students. The group included Kaylee Baldwin, Colton Barton, Lauren Bearden, Katelyn Bewley, Rachel Bomar, Rachel Foster, Harris Gregory, Tyler Hunt, Jennifer Owen, Jason Sikes, Mason Towery, Alex Ward, and Madison Whittle. AP Environmental Science had 18 students earn qualifying scores. The list included Olivia Brown, Ella Burch, Allison Byrn, Katelyn Carver, Gerald Cline, Meg Foster, Karley Keen, Colby LaFitte, Nathan McGuffey, Jennifer Owen, Abi Penick, Matthew Ranney, Brayden Richer, Kaleigh Shaw, Savannah Shivers, Hunter Shores, Owen Stamper, and Austin Threet. In AP United States History, nine students earned qualifying scores. The students included Lauren Bearden, Katelyn Bewley, Charles Boucher, Jerica Eaton, Tyler Hunt, Jennifer Owen, Jason Sikes, Mason Towery, and Madison Whittle. Additional students earning AP qualifying scorers included Jason Sikes in AP Chemistry, Maggie Adams, Colton Barton, and Solomon Kieffer in AP Physics, William Davis and Damon Stone in AP World History, and Maggie Adams, Reagan Burch, and Hayden Petty in AP English Language. Current students received their reward checks last week while the 16 students who graduated in May will be mailed their reward checks.